Took Patsy and Roy down to Mexico. John and Tillie didn’t want to go back and Patsy and Roy had their passports over-nighted just so they could go. We had no problems going. We felt very safe the last time we were there. We had plenty of time to look around. Roy got his shoes shined, man, where they BRIGHT! When we got ready to eat, I remembered they way so they told me to lead and they would be “right behind me.” Walked down the block, around the corner, crossed the street and turned around…NOBODY WAS BEHIND ME! How can anyone get lost in a town the size of two blocks long and three blocks wide? I started retracing my steps and didn’t see anyone. Figured I would go back to the plaza and wait, w ho knows what shop Patsy dropped into. When they finally saw me they yelled at me for getting lost! ! I WASN’T LOST, THEY WERE! They all had visions of me being kidnapped by the Mexican Cartel. Fffffpt! Who would want me? None the less, we made it to the restaurant and had a wonderful luncheon in a real Mexican restaurant.. The wait to get out of Mexico wasn’t bad at all, only took an hour. Again on the way home, we took them through the lettuce farms. Long day. Today we rode down to Castle Dome Ghost Town and Museum with Rick and Becky. We were here last year. The Craps table in the back of the saloon was gone, replace with gaming tables. Happy we got to see it last year. We spotted our first coyote of the trip on the way up to the ghost town. Ricky and Becky left us today to return home to Florida. Becky has to get back to work. I was glad they got the opportunity to travel West, even though it was colder this year. The land out here is so different and rugged. And windy. And dusty. And sunsets are beautiful out here. Today was moving day! We drove up the road to Lake Havasu City. 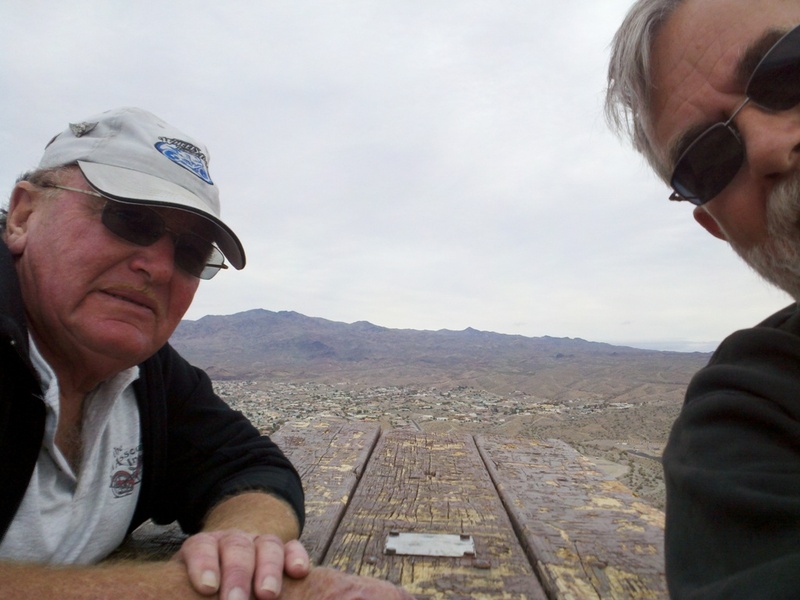 Staying on more BLM land outside of Lake Havasu. We were not parked at the perfect angle for our solar panels, but they did work fairly well. We are on a hill where we should be able to see the fireworks display that they will be having later this week. We had our coaches all decorated up for the holiday! Bob got me roses for today and I shared them with Patsy and Tillie and Tillie shared her candy with Patsy and I, and Patsy gave us cards and the boys candy! We took happy hour on the road today and drove down to the Turtle Bay Beach Bar. Fabulous Quesadilla’s and Calamari and Margaritas. Dinner was steak!…oops! Too many appetizers…steak is tomorrow night! Bob and John will walk anywhere! Today they walked to the TOP of Picnic Table Mountain…so nicknamed because somebody, somehow, managed to get a picnic table up on the tippy top of this mountain. They said at times they were mountain climbing because the path had become so narrow. They were using a path that the bighorn sheep use when walking around the mountain. Woke up feeling kind of crappy from the cold I finally caught from Tillie. Bob and I stayed home while the rest of the gang took the boat over from The London Bridge to the Nevada side of the lake where they could gamble at the Indian Casino. For the next four nights there will be fireworks displays being given by the Greater Western Pyrotechnic Assoc. I have put up a lot of pictures to show you just how amazing they were at night. We did have to drive down to the park where they were shooting them off to get a really good view. The nights have been pretty cold here, and most times the ladies stayed in the car to stay warm. Monday, February 21, 2011 – Moving Day, Again ! Today we left Lake Havasu for Laughlin, NV. Patsy, Roy, John, Tillie, Bob and I. They still have Casino Dr. all torn up with road construction replacing water or sewer lines so we drove in the back way to the Tropicana Hotel and RV Park. It’s no longer free so we had no trouble finding space this year. Basically for $35 a week, we get water, a dump station and a free parking space, unless of course, you gamble enough money away they will comp you the fee and give you a free hotel room. We never saw the inside of a hotel room. Many of the people we met last year are here again this year. One couple, Dale and his wife Betty are from British Columbia, Canada and we all had a blast together. Road Trip! We’re off to Oatman, AZ to see the burros and get some lunch. We didn’t see any babies like we did last year. But they were having gunfights in the street this year. While sitting in the restaurant, Bob and Patsy went out to get a picture of them. Then I heard them shooting again and I went out to see also. Walked over to the steps to sit down, and ….just as I was going to sit, they drew their guns and fired! ! ! Scared the s#%t out of me, and I fell backwards all the way over on my back with my feet in the air! ! 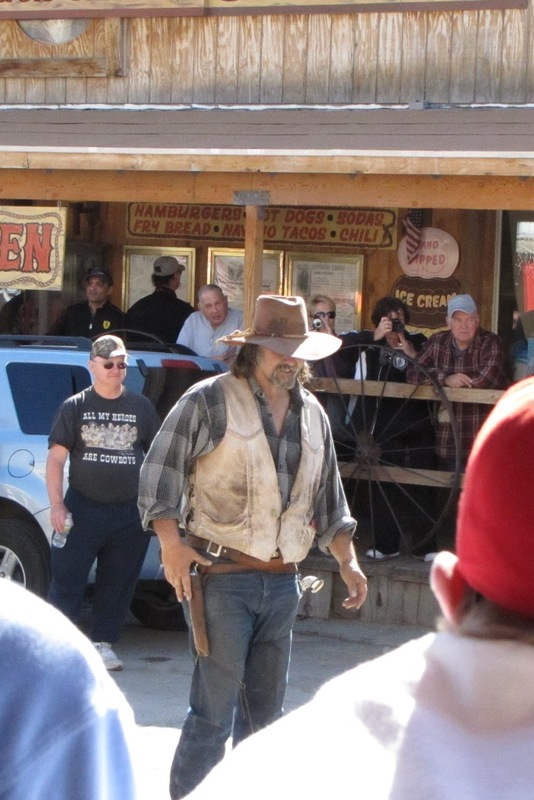 The crowd roared…and it wasn’t at the gunfighters! The funniest part was I couldn’t get back up. Somebody yelled, “YOU SHOT HER”, and the crowd roared even more! Talk about embarrassing! But it was also very funny, even the gunfighters couldn’t keep a straight face! I was the hit of the show. Guess who didn’t get a picture?